Thanksgiving Tablescape 2012. Grain sack table runners, heirloom silver, mini pumpkin tureens, and monogrammed linen napkins. 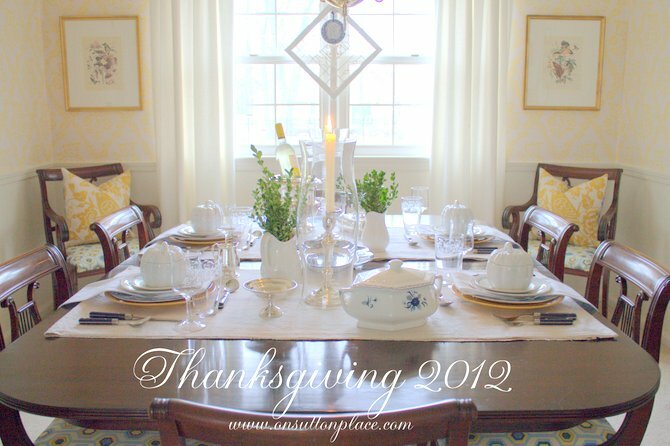 I’m sharing my second ever tablescape since On Sutton Place began. I really need to do this more often because it was incredibly fun. What’s even better is that we will actually use this table setting for Thanksgiving day. It will be just the four of us this year. After 31 years of going here and there, we are staying home. Honestly, I’m not the least bit sad. I am truly looking forward to a relaxing day with my family. What do you think of my shiny and bright ice bucket/urn? I’ll be back in a day or two to share how I did it. Let me just say…Andie you are the best! While I was cleaning the urns, I cleaned some heirloom pieces I received when we emptied my father-in-law’s home. Along with the urns, this is one of my favorites. I stayed true to my philosophy of mixing things up when I was setting things out. I combined antique grain sacks with shiny, vintage silver. 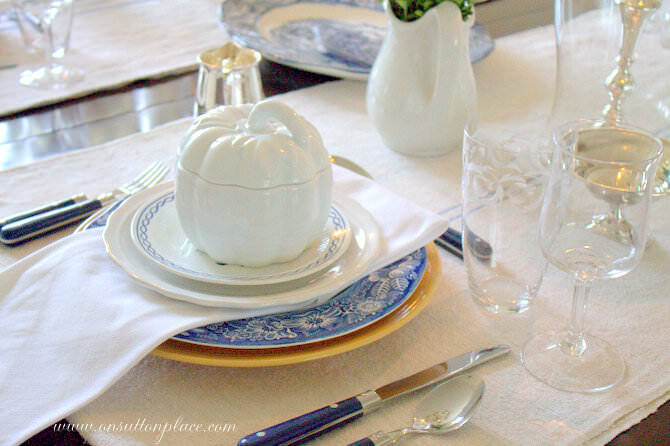 Inexpensive pumpkin soup tureens paired perfectly with English Ironstone. Boxwood from my yard in flea market pitchers. 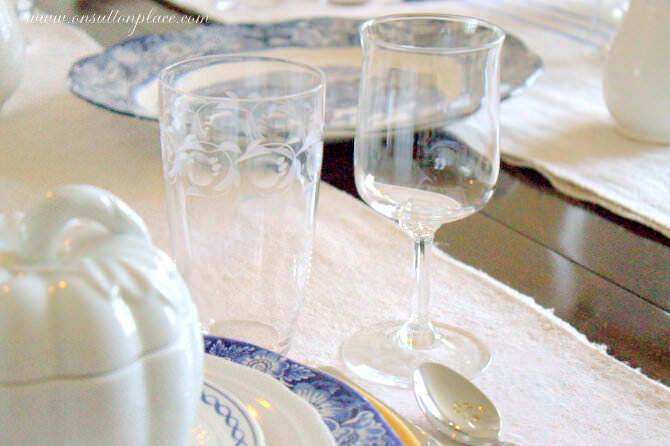 Heirloom etched glasses look lovely beside our crystal wine glasses received when we were married. My navy flatware was a Christmas gift last year from my daughter. 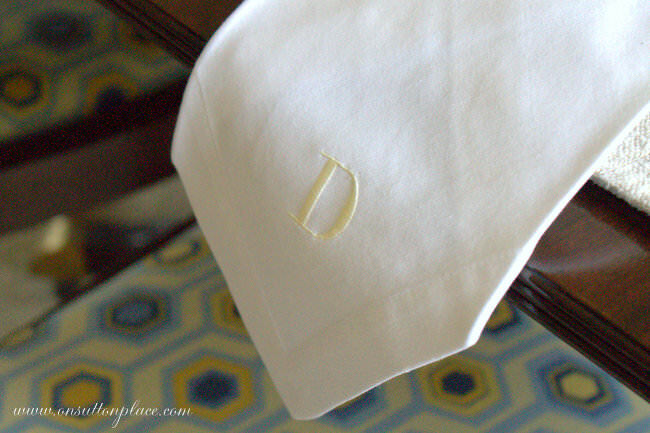 Monogrammed linens are the finishing touch. This Thanksgiving will be different from years past but I hope to start new traditions. I’ll have time to sit with my family and enjoy just being with them. Talking and laughing. Hanging out with the dog. Maybe taking an after-dinner walk. Whatever we come up with will be fine with me. We’ll be together and I’m sure you’ll agree…that’s what counts the most. Your table looks lovely, Ann. Very crisp and fresh. Hope you had a wonderful Tgiving! Now on the Christmas! Ann, it’s beautiful! And, I’m a sucker for those blue floral plates! Hi Ann, It’s all so beautiful! I love the boxwood cuttings, great idea. Its all just beautiful Ann! I love how you have mixed heirloom pieces in and the silver is gorgeous. You have created such a lovely setting for your family to enjoy! 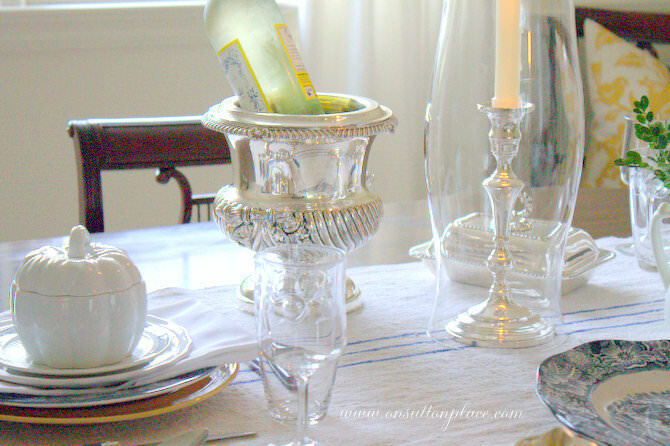 Your tablescape is very pretty, and your urn is gorgeous! 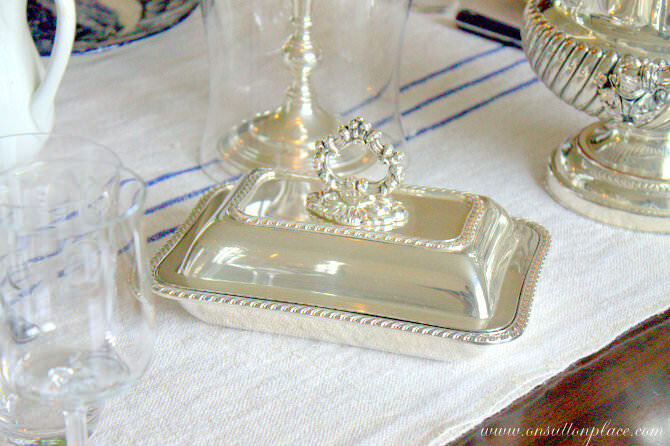 Your silver butter dish is equally lovely as is everything else. Lovely tablescape! I thoroughly enjoyed your guest post on MMS. Your table looks beautiful and I love your soft touches. Have to say I love your snap of your little Schnauzer! 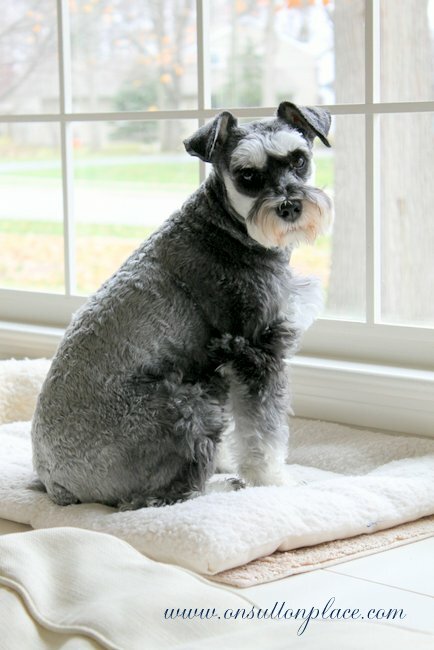 I’m a bit partial to mini Schnauzers. Beautiful table and so inspiring! Please share the silver polish info as soon as you can! I have serving pieces in desperate need of a good cleaning, and if there is even a slight chance of coming close to the results you achieved with your beautiful urns, I’m postponing this job until your post! Beautiful tablescape, Ann! The ice bucket and urn are such lovely pieces! I love it all! Your table setting is really gorgeous. I love the mix of old and new too. I can’t wait to hear how you got your silver so shiny! It looks amazing. I like how you used one of those urns as a bottle holder too. Great idea! Your plans for Thanksgiving sound great to me! My poor husband has to work all day at the firestation. So he won’t get to join us. I’ll be spending it over at my brothers house this year. There will be alot of people and a long drive to make. Hopefully, I’ll have the energy to last all day! ha! Beautiful & elegant! I love it. Just stunning Ann, I love how everything looks crip and clean. 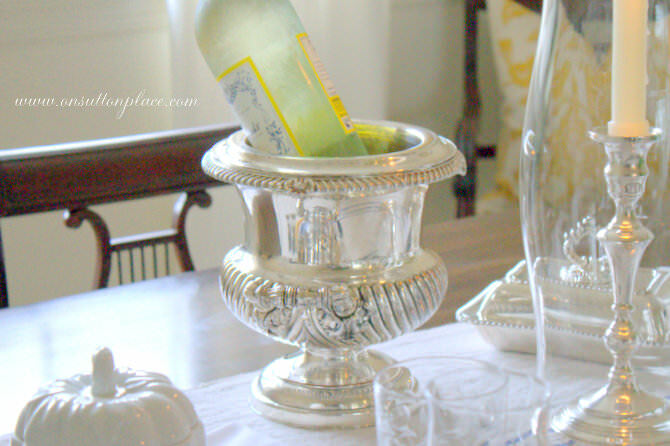 I love the wine bucket a beautiful touch. You’re right, Ann. You should do this more often. Your table looks lovely and so elegant. It is going to be just four of us for Thanksgiving this year, too. I’m looking forward to it. Just beautiful. Love the simplicity of this. AND the little tureens are from Kroger. Oh my. Your table is serene and really lovely. Love it! 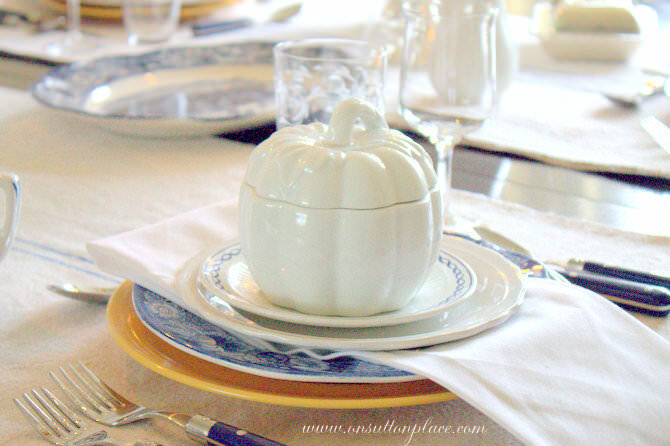 and love love love those lil punkin soup tureens, so cute! being nice to be home. That is right where we are too, and have been for awhile now. come along, and I will be ready and looking forward to that too. Course, they live nearby so that helps. Ann, your tablescape is perfection! I love how you’ve drawn the yellow-gold color from your dining room walls onto the table. 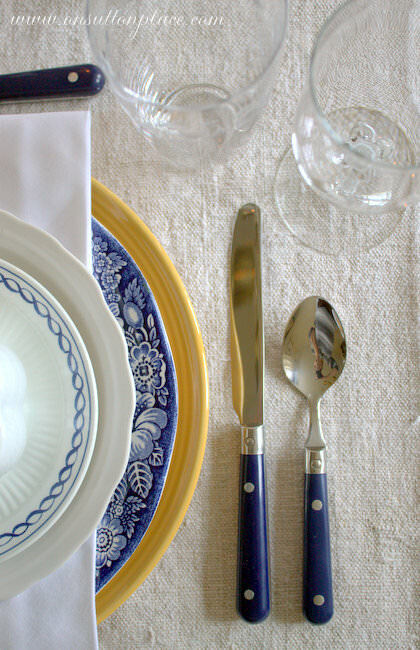 And the navy flatware is gorgeous with your dishes and your grain sack runners. Now that you have your table set, you can enjoy a glass of wine! Ann, that is so pretty ….. it simple and elegant at the same time ! Ann, the tablescape is gorgeous! And, I love your china. 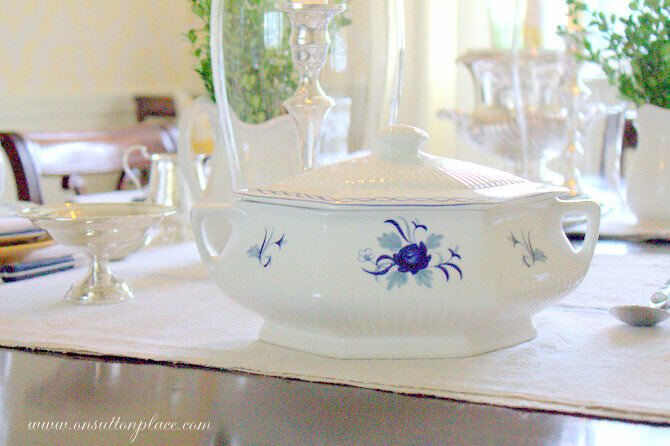 I am looking for a few pieces to go with my Spode dinnerware. The urns turned out beautifully. The mixture with your new and vintage items brings it all together. The best is seeing your wonderful grainsack under it all. I completely agree with you. I love your table. 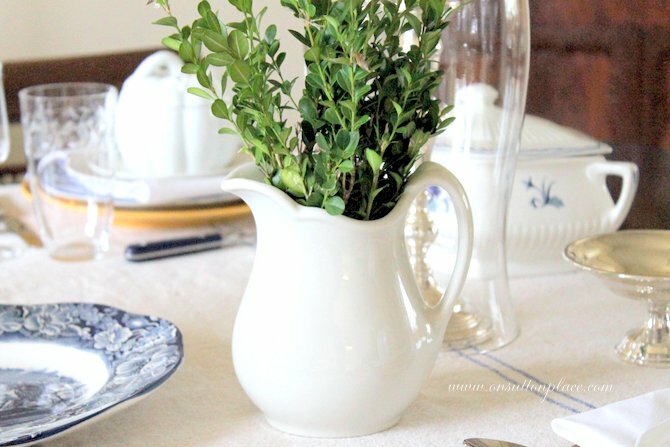 I love the idea of using boxwood in the white pitcher. That’s an idea I can totally copy. I also really love that you silpped the hurricane sleeves over the candlesticks. It adds an extra sparkle. Hi Ann. Your table is lovely and elegant! I hope you and your family enjoy a special day together. Beautiful settings for Thanksgiving. It is always blessed to be with family no matter what. Have a wonderful Thanksgiving. ann, what a beautiful job you did. and those urns….so beautiful. you will have a happy thanksgiving! We have had Thanksgiving with just the four of us for the last several years. It’s wonderful. I love a day that is just about being together. Nowhere to go, no gifts, just good food and family. Your table is so lovely. Stunning tablescape! YES!!! You should do this more often!!! I adore how you’ve blended and mixed heirloom with vintage and flea market finds! 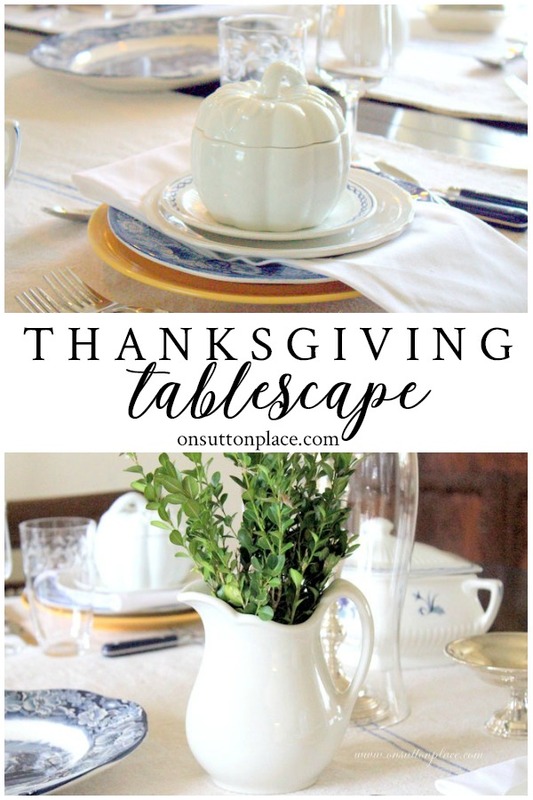 Enjoy your Thanksgiving Day with family and please share more tablescapes with us in the near future!!! Visiting from Marty’s Table Top Tuesday! So pretty, Ann! Your photos are so sharp and crisp. Great lighting. Have a wonderful Thanksgiving. Your table is lovely. Oh, Ann…the table is gorgeous! Isn’t tablescaping addicting? I find it very relaxing picking out my favorite dishes and accessories. I LOVE all of your silver pieces, especially the wine bucket. I’m happy that you are spending a quiet day at home…we need that before the hustle and bustle of the Christmas season! This is so pretty, Ann and you and I are thinking alike with colors. Stunning! How do you manage such a clean look but so lush at the same time? LOVE that champagne bucket. just gorgeous, Ann. Love the silver and ironstone, too!! Your table setting is beautiful Ann! Your day sounds like it will be so lovely. Ann, Your tablescape is absolutely lovely!! Every detail is perfectly beautiful. Your urn is gorgeous. Waiting to hear how you cleaned it. Hope it was easy because I have one to polish. Trust you and your family have a wonderful Thanksgiving. Ann, It’s so elegant and classic! 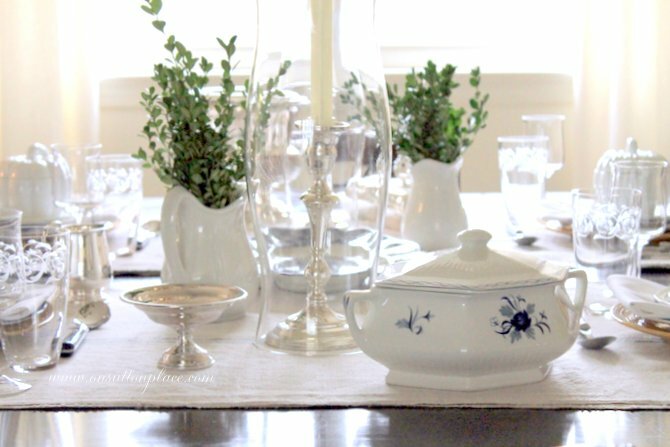 I have always loved the blue and white, and the boxwood is such a lovely touch. We are leaving on Friday to see our family and I ‘m so excited! Gorgeous, Ann! I love how crisp and clean it is. I noticed you had some Cupcake wine chilling for me….it is for me, right? Love the boxwood tucked into the pitchers…my favorite! It’s beautiful Anne! I love it, I am in love with anything white/cream/natural right now. Are those little soup pumpkins from World Market? Oh Anne, your diningroom looks light, happy and inviting and your table is delightful. Nothing is more important than family. Like you, we have many pieces of silver that were passed down. My late father-in-law was a semi pro tennis player and the bowls, dishes, trays are spilling out of the cupboards. Looking forward to seeing how you got that lovely shine. Oh! Yay! It did a great job! I love, love, LOVE this setting! Every last thing! I can almost smell the boxwood!